Defined as an outstanding interpreter and as one of the leading figures in the worldwide panorama of marimba and percussions, Filippo Lattanzi began his study of percussion instruments when he was 6 years old, obtaining a diploma at a very young age with the highest marks and praise at the Niccolň Piccinni Conservatory (Bari, Italy), under the guideance of Benny Forestiere. He continued his studies with Gastone Sylvestre at the Conservatoire National de Region de Rueil Mailmaison (Paris) where he was awarded the gold medal and the 1er Prix de la Musique ŕ l'unanimité et-felicitations for four consecutive years. In 1998 he was conferred  for the first time ever, by the unanimous decision of the board  the Premier Prix Spécial de Virtuosité en Marimba. During the same period he perfected with Robert Van Sice, Michael Rosen and Leigh Howard Stevens. Lattanzi has presented Italian and world premiere performances of works by Richard Rodney Bennett, Luciano Berio, Carlo Boccadoro, Mauro Cardi, Franco Donatoni, Jean Pierre Drouet, Petr Eben, Eric Ewazen, Gareth Farr, Ivan Fedele, Marie Helene Fourniér, Vinko Globokar, Gerard Grisey, Evan Hause, Raymond Helble, Peter Klatzow, Peer Norgard, Jane OLeary, Steve Reich, Ney Rosauro, Joseph Schwantner, Alessandro Solbiati, Toru Takemitsu, Andrew Thomas, James Wood, and many others. Lattanzi performes as a concert soloist in Italy, France, Greece, Germany, Poland, Turkey and the United States. From 1996, he was selected by the Associazione Romana Amici della Musica, to represent Italy in the most prestigious European exhibitions of contemporary music. He plays regularly in some of the most important concert halls, such as the Musik Halle in Hamburg, the Chopin Musical Academy in Warsaw, the Praha Concert Academy, the Teatro Comunale in Bologna, the Teatro Comunale in Ferrara, the Auditorium della RAI in Turin, the Teatro Comunale in Firenze, the Teatro Valli in Reggio Emilia, the Teatro Politeama in Palermo, the Sala Giuseppe Verdi in Milan, and the Piccolo Teatro alla Scala in Milan, the Konzertsaal KKL in Luzern. In addition to his work as a soloist Lattanzi has been involved with a number of orchestras working with musicians such as Salvatore Accardo, Martha Argherich, Luciano Berio, Pierre Boulez, Diego Fasolis, Vinko Globokar, Alain Lombard, Elliot Gardiner, Lorin Maazel, Misha Maisky, Michael Pletnev. Mr. Lattanzi collaborated for different years as Keyboard and percussion player of Orchestra della Radio e Televisione Svizzera Italiana of Lugano (CH). His activity as an artist has included hundreds of concerts as a soloist (in Italy, France, Germany, Greece, Poland, Turkey and the United States), with which he has combined performances in chamber music, where he plays with prestigious ensembles such as the Wood Drops Percussion Ensemble (founded by Lattanzi himself), the NexTime Ensemble and the Arnold Schoenberg Choir in Vienna. He has to his credit a large number of first-time recordings of pieces for Marimba solo and Concerts for Marimba, Percussion and Orchestra composed by such authors as Bennett, Berio, Donatoni, Drouet, Fedele, Globokar, Grisey, Schwantner, Takemitsu, Thomas, and Wood (recorded for the Koch-Schwann-Aulos, NAXOS, and FORLANE labels). He debuted for DAD RECORDS as a soloist, recording different monographic compact discs of authors such as Johann Sebastian Bach, Richard Rodney Bennett, Fulvio Caldini, Raffaele Gervasio, André Jolivet, Steve Reich and Joseph Schwantner. He teaches specialisation courses promoted by the European Community, the Fondazione Arturo Toscanini of Parma, the Associazione Percussionisti Italiani, the International Music Teachers Association of Los Angeles, the Oberlin College of Music, the New Mexico State University, the Indiana University (Evansville  USA), the Harrison College (USA), the Percussive Arts Society, the Cleveland Institute of Technology, The Michigan University, for the Percussive Arts Society, for the Perkumania Festival (Paris). He is the teacher of Percussion Instruments at the Conservatory Nino Rota of Monopoli (Bari - Italy). 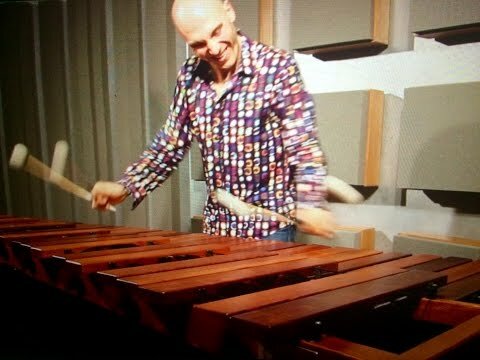 I have been disappointed with performances of Bach on marimba in the past, but since hearing the latest extraordinary offerings from Filippo Lattanzi on CD I have been convinced of the efficacy and validity of these transcriptions and gained new confidence in the future of the genre for marimba. I find that I have rediscovered Bach and am overjoyed to hear the music anew and in a new light. The playing is elegant and technically brilliant with seamlessness and suppleness. He has a warm sound and the playing is solid, laced with well-conceived ornamentation. I am particularly impressed with the beautiful recording quality of this CD, which was recorded in Santo Stefano church in Italy. The sound is lavish and warm, especially on the four-part chorale, with just enough reverberation to create the feeling for the listener of being in situ. This musician will serve as catalysts for future marimba players who surely will play Bach with confidence and attention to stylistic details and with a historical perspective that other instrumentalists demonstrate. Anyone who has ever seriously asked whether Bach can be successfully played on marimba should pounce on these CDs. Just a note to say 'hello" and to offer my congratulations on your excellent recording, "Fields". American music are very well performed. Congratulations on a fine recording and on your superb and beautiful playing! ...incomparabili le sue esecuzioni del Clavicembalo ben temperato di J. S. Bach alla marimba. This CD is an ideal showcase for the playing of Filippo Lattanzi and his insightful performance of American music informed by and sea-soned with Italian passion. il maestro italiano ha creato dei suoni magici che hanno letteralmente incantato il pubblico presente. La sua abilitŕ nel suonare la marimba non č stata solo un piacere per ludito, ma anche uno spettacolo quanto mai gradevole da vedere. Sotto la guida magistrale delle abili mani del musicista, le quattro bacchette hanno danzato contemporaneamente sui tasti lignei emettendo un susseguirsi di suoni, ora delicati ora piů intensi, con grande trasporto e fascino. ...Filippo Lattanzi si č manifestato sul suo strumento in tutta la sua grandiositŕ e perfezione.